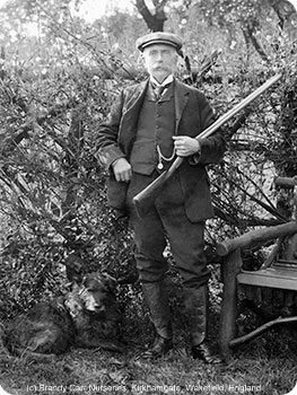 The business at Brandy Carr was started by my great grandfather Joseph Saville Ramsden in 1870. He was a florist growing ferns and conservatory plants for country houses and conservatories. Also grown at this time were cherries, pears, apples and strawberries. He retired in 1910, the business passed to my grandfather, Saville Helm Ramsden. He carried on in the same way. In 1939 land was turned over to food crops. Then I think we would have been growing peas, spring broccoli, cabbage etc. It would have been at this time he introduced rhubarb to the farm. 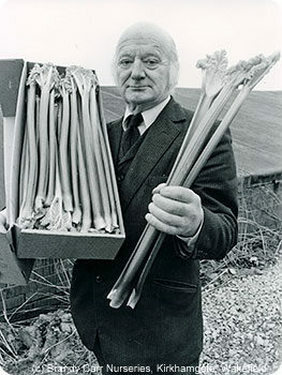 In the lead up to World War Two and as it became a good trade for forcing rhubarb, my grandfather began to grow a lot more. He was the secretary of the Leeds and District Market Gardeners Association, which had at that time about 30 members reaching from Stanley, Rothwell, Cottingley, Pudsey and Wortley. Our place at Brandy Carr was about the limit on the western side although there was a grower at Alverthorpe and several at East Ardsley. At that time as far, as I am aware, the main varieties for forcing rhubarb were Albert and Victoria. There was also a very early Champagne, although once it had it’s first crop pulled was not of much further use. A bit later another very good variety was grown and produced by William Fenton of Tingley, known as Fenton Special. This was a better colour than the others. There was another variety called Grey Giant which while a heavy forcing cropper, had a bad tendency to break and fall in the shed, so it was not grown much at all. As market gardeners we always had a problem feeding the rhubarb as it needed a lot of nitrogen so we used Australian white wool, shoddy from Stonehouse’s Mill at the bottom of Westgate, Wakefield, sewage from Knostrop near Leeds, pressed sud cake from any of the woolen mills and slaughter muck from Wakefield Slaughterhouse. We had about 72 acres in all and keeping the rhubarb fed was quite a task. We also grew mustard as a green manure when we got short. We had one big forcing shed and two smaller ones. Growing rhubarb was hard work for the men. Victoria roots at two years old weigh between 2 and 4 stone each. These required two men with forks to throw them up on the carts. They could only be put in one layer to protect the roots and also to consider the weight for the horses. It was hard on the horses as they were used to plough out the roots and then used to transport them to the farm. The horses worked Monday to Friday and until lunch time on Saturdays. They got Saturday afternoon off and all day Sunday. I think everyone was pleased when we finally got a tractor instead of the horses. Orange boxes were originally used to transport the rhubarb sticks to London. These weight about 6 stones when full and were large and awkward to handle. The Leeds and District Market Gardeners Association decided to standardize the boxes. These were made of thin wood and weighed a stone when full. Blue paper was used to protect the rhubarb, blue was chosen from an aesthetic point of view to set off the red sticks. In 1962 my grandfather retired and my father Norman Asquith took over the business. He rapidly expanded the business, building up stock levels and varieties of rhubarb. 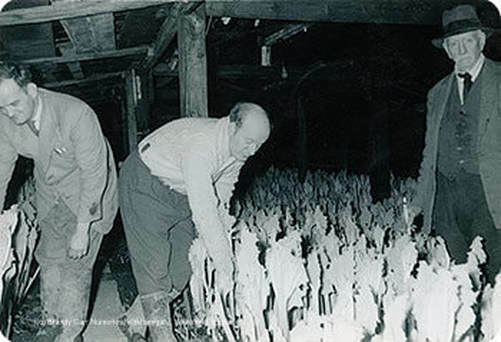 At one stage he had approximately 150 acres of rhubarb growing in the local area. During the late 1960’s and 1970’s local small growers would bring their rhubarb to sell through Norman Asquith Produce (NAP). Originally there were about 70 growers this number decreased dramatically over the years. In 1993 after the death of my father I took over the business. I have added more than 100 varieties of rhubarb to our stock, both ornamental and culinary. This is the largest range of varieties in West Yorkshire, with limited stock of the rarest varieties. This year I have been growing rhubarb in pots as a trial to extend its planting time. I have used Timperley Early and Stockbridge Arrow, so far the trial has been going well, but I will know whether it has been successful in the next few months. After World War 2 the food situation was quite bad specially sweets which is where liquorice came in. 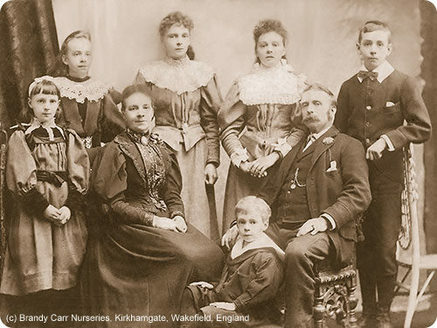 He had a friend called Ernest Carter, one of a big family of Carters who lived at South Bailey Gate in Pontefract who was also a big rhubarb grower at Baghill. My father found he had a demand for liquorice root and soon began to sell it. One of his main customers at that time was Quartons of Scarborough who had a big double ­fronted shop. The liquorice was sold in bales about a yard long – the root looked like bamboo canes and the bales weighed about 40lbs. When sweets became more plentiful liquorice fell out of favour. I am following in the tradition and growing traditional Yorkshire Liquorice plants, this time to sell to the public. All liquorice for the sweet factories is imported from warmer countries where production is quicker due to the climate and cheaper due to labour costs. I wanted to include a piece in my web site about my dad. 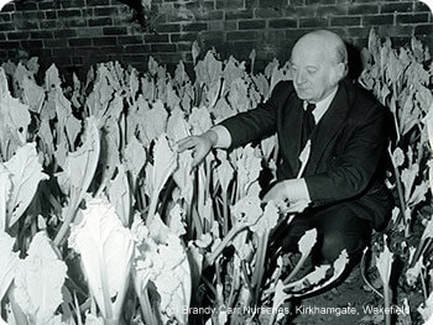 He was a big part of the Yorkshire rhubarb industry and his importance has largely been forgotten. He did not start his working life growing rhubarb. 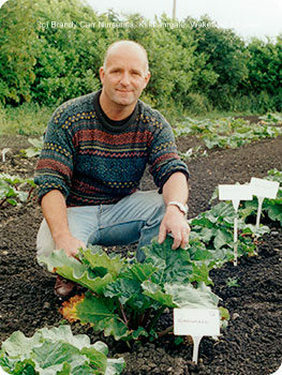 He did a variety of jobs, before wholesaling produce from Pontefract. His original business name was Norman Asquith Pontefract; the Pontefract was later changed to Produce. Dad and my uncle Sid worked the business together initially. As the business expanded more of the family came to work in it. Over the years the family and the business expanded together. He saw that just after the Second World War England needed food. There was not the availability of inexpensive imported food we have today. This was why he started NAP. 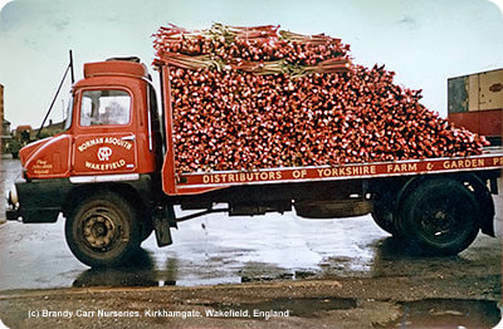 At this time both my parents would take a flat back wagon to London loaded up with rhubarb. The rhubarb was stacked and sheeted not boxed and packaged. He dealt with business all over the country, including Batchelor’s pea factory in Sheffield. When my grandad retired my dad took over the running of the business at Brandy Carr Road, soon it and my dad were known as NAP. This was when the Pontefract connection was lost. He demolished the small impractical buildings and built a large open airy building. it was similar to one of the businesses he dealt with in Lincolnshire. This was built in 1968 again he was ahead of his time as most produce was dealt with in old dark barns. During the late 1960’s and 1970’s land was cheap and a number of farmers had no relatives wanting to carry on. He took advantage of this buying land at Kirkhamgate, East Ardsley and Wrenthorpe. This purchase of land made the business expand rapidly. NAP became a depot for small growers of produce, not only rhubarb, to sell their goods. At that time it was difficult for small growers to market their goods. The growers came from as far as Pudsey to deal with my father. At one point he was dealing with approximately 70 growers. He was selling his own produce as well as that of others to traditional markets and supermarkets, at a time when the supermarkets did not have the purchasing power they have today. The business NAP, ceased not long after my dad’s death as there was no direction for it to go. The supermarkets made trading with them uneconomical and there were fewer alternatives than there had been in the past. He was a man with business acumen and ability to spot an opportunity and act upon it. This is a rare trait in any man and I feel very proud that he was my dad. He was in the right place at the right time and made the most of it. Today it would be uneconomical to do what he did, rising overhead costs and legislation would make it impossible.